Effective immediately, no new nominations for NCI MERIT (R37) awards will be made. In addition, NCI MERIT (R37) extensions will not be considered. As a reminder, competing continuation R01s that score very well can be nominated for R37 which means that you get 10 years of non-competing instead of the usual limit to 5. That last bit in the quote refers to the fact that apparently these things can be extended even past the first 10 years. A search on RePORTER shows that the NCI has about* 43 of these on the books at the moment. *I didn’t screen for supplements or other dual entries. 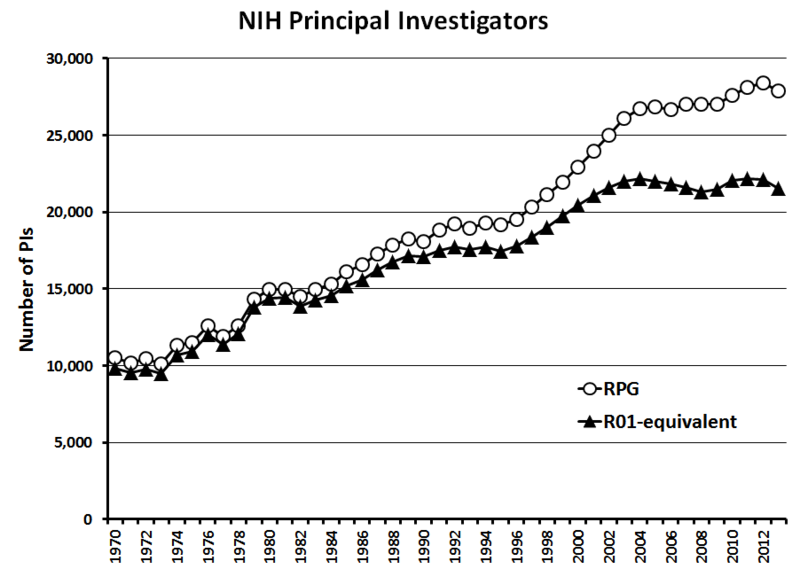 Do you always get about the same score on your NIH grant? This question is mostly for the more experienced of the PItariat in my audience. 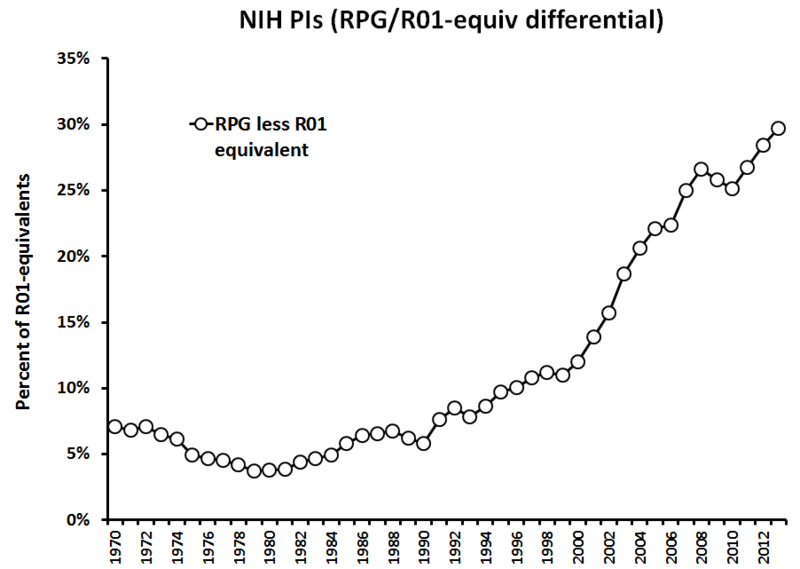 I’m curious as to whether you see your grant scores as being very similar over the long haul? That is, do you believe that a given PI and research program is going to be mostly a “X %ile” grant proposer? Do your good ones always seem to be right around 15%ile? Or for that matter in the same relative position vis a vis the presumed payline at a given time? Or do you move around? Sometimes getting 1-2%ile, sometimes midway to the payline, sometimes at the payline, etc? This latter describes my funded grants better. A lot of relative score (i.e., percentile) diversity. It strikes me today that this very experience may be what reinforces much of my belief about the random nature of grant review. Naturally, I think I put up more or less the same strength of proposal each time. And naturally, I think each and every one should be funded. So I wonder how many people experience more similarity in their scores, particularly for their funded or near-miss applications. Are you *always* coming in right at the payline? Or are you *always* at X %ile? In a way this goes to the question of whether certain types of grant applications are under greater stress when the paylines tighten. The hypothesis being that perhaps a certain type of proposal is never going to do better than about 15%ile. So in times past, no problem, these would be funded right along with the 1%ile AMAZING proposals. 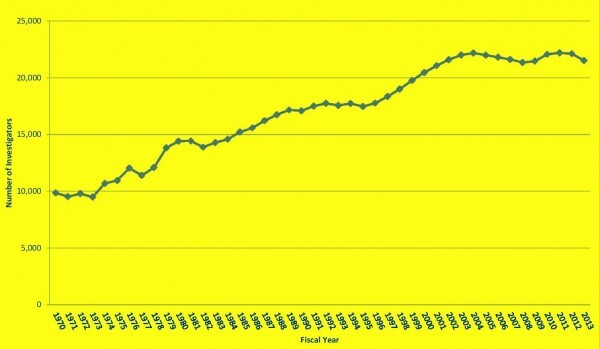 But in the current environment, a change in payline makes certain types of grants struggle more.